The article talks about a corporate plan as a necessary precursor to a marketing plan. At the same time, however, Mr. Buscemi also rightly points out that the opportunity may exist in some organizations for a marketing organization to actually take the lead in planning when the corporate layer is dragging its feet. It comes to mind that, while we occasionally hear about the apparent diminishing importance of the CMO’s role in the boardroom, what better way to reestablish the value of the marketing function than to play an important, or even leading role in corporate planning? Situation Analysis So, as shown above, many critical marketing planning components discussed by Mr. Buscemi are addressed within the Internal and External Situation Assessments we recommend here at Corona. But are there any more direct links between the corporate level and the marketing organization? 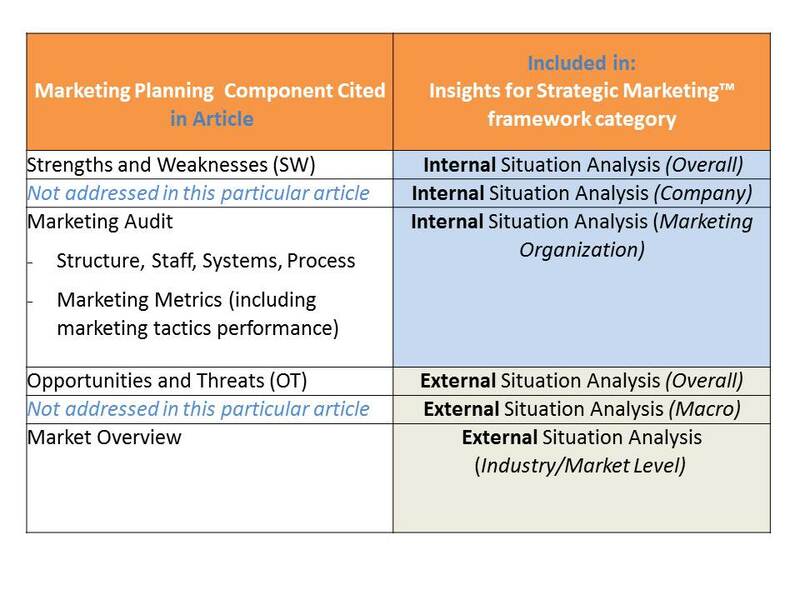 Our Insights for Strategic Marketing framework has a macro, company level component within the Internal Situation Analysis, which borrows from overriding company goals, strategy, brand, and capabilities for consideration as these inform marketing planning. Similarly, our framework also has a macro-level component within the External Situation Analysis that includes a PEST (political, economic, social, and technology) analysis, or trend analysis, that identifies big picture trends affecting the business unit(s) considered– certainly information that may, in turn, be valuable to company level planning. Speaking of the company level, our framework and process also calls on a common strategy tool (GE/McKinsey Matrix) to most effectively evaluate current market attractiveness (as established in our External Situation Analysis) in light of our business unit strength (as established in our Internal Situation Analysis) for product portfolio investment decisions. This is another level of planning that is obviously highly relevant to both the company and its marketing organization. After such an evaluation, we’d say we’re ready for installing high level marketing goals. Again, these are interrelated and will be highly important and relevant to company level goals, given that these will no doubt rely on measures such as revenues, profit margins, market share, etc. To develop marketing strategies to achieve goals, one of the first resources we recommend putting to use is Ansoff’s product-market strategy matrix. It is an excellent starting place. The puzzle pieces are now complete for the first stage of top-level marketing organization planning, which is also highly interrelated to corporate planning. Now, on to market segmentation. Have you completed your top-level marketing organization planning?